A full range of Delivery and Suction Hoses from Hutchings Direct that are capable of meeting the toughest demands for a wide range of commercial and domestic pumping applications. Manufactured to offer high performance whilst remaining lightweight and compact enough for easy transport and storage. Available in a range of sizes and lengths. A High-capacity 10m x 25mm discharge hose made from hard-wearing and f.. The 1.25" Layflat Delivery Hose is manufactured from durable reinforce..
A High-capacity 10m x 32mm discharge hose made from hard-wearing and f.. The 1" Suction Hose is manufactured from vacuum-sealed spiral hose and.. The 1" Layflat Delivery Hose is manufactured from durable reinforced P.. The 1.5" Layflat Delivery Hose is manufactured from durable reinforced..
A High-capacity 10m x 40mm discharge hose made from hard-wearing and f.. 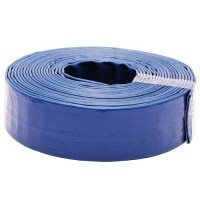 The 2" Layflat Delivery Hose is manufactured from durable reinforced P.. The Karcher Fabric Hose Set is the perfect addition for your Karcher s.. The 3" Layflat Delivery Hose is manufactured from durable reinforced P..
A High-capacity 10m x 50mm discharge hose made from hard-wearing and f.. The 1.5" Suction Hose is manufactured from vacuum-sealed spiral hose a..